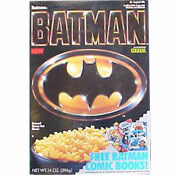 In the mid 80's, Nerds Cereal asked us, "Which side are you gonna eat first?" The cereal box was divided into two separate compartments - each containing its own flavor of Nerds Cereal. Two dual varieties were offered: orange/cherry and strawberry/grape. It was described by Ralston as being a "tiny tangy crunchy sweetened cereal". 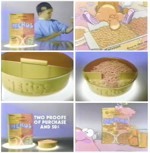 The cereal's premiums included small boxes of Nerds candy in the box and a send-away offer for a "Two-Sided Nerds Bowl" with a "Nerd Gate" - as seen in a commercial the "Nerd Gate" lifted to allow milk on one side of the bowl to flow into cereal on the other side. There were reports that eating Nerds Cereal would produce a bright red-orange stool - an alarming, if hardly life-threatening, health condition. Nerds Candy was introduced by Nestle's Will Wonka division in in 1983. Still available today, the candy most often comes packed in a double-sided box featuring a different flavor on each side - which explains the dual nature of Nerds Cereal. The vibrantly colored candy pieces come in in rounded non-distinct shapes that look vaguely like tiny popcorn pieces crossed with small teeth. 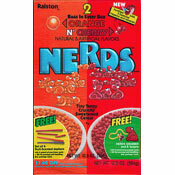 The nerd characters featured on the candy and the discontinued cereal resemble the candy pieces, in as much as they are small, colorful, occasionally bulbous and strange. The distinctive personality trait of the characters appears to be indecisiveness - as they have a hard time choosing which side of Nerds Cereal they should eat first. What do you think of Nerds? View all 65 comments for this cereal. Probably discontinued because it must've been a pain to produce this cereal with two small bags of two different flavors going in one divided box. Also sounds kinda hard to pour out of the box too. I want Nerds cereal to come back. I don't care if I have colored poo. Bring it back please? 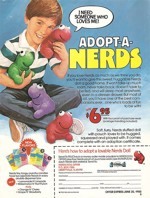 Never had it - only saw the commercials, but I wanted that Nerds mail-away thing SO bad! I would love to share with my children what I had when I was their age. Please bring back the Nerds Cereal! The candy is still here! Lets bring Nerds Back! Sign the Petition!! Search for it at change.org. It's there ready for your support. I always wonder when Nerds cereal is going to come back. I loved it as a kid and would love to buy it for my kids (if they could keep me out of it) so please bring it back!! Every time anybody says something about cereal, I talk about Nerds and how much I miss them. Please bring Nerds cereal back! Bring back Nerds cereal! A favorite at my house! I remember as a little waking up on Saturday morning and my ma fixing me a big bowl of Nerds cereal and I would watch cartoons and eat my Nerds. I have for months now been craving this cereal and I don't know what to do.. Please please please with Nerds on top, I would love to see this particular brand cereal back on the shelves. Please being back Nerds Cereal. Thanks! Please, please, please bring back Nerds cereal! 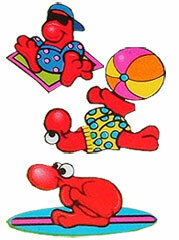 This was my FAVORITE as a kid. I think about it all the time!